It goes without saying that if you want to get somewhere, you gotta know two basic things. Where you are and what 'getting there' actually looks like. The problem is that when you're starting a new comic book you don't really know what it'll look like in the end. You just know you want it. 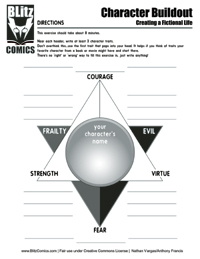 Simple, visual ways to generate character, plot, and story can help solidify your end game. 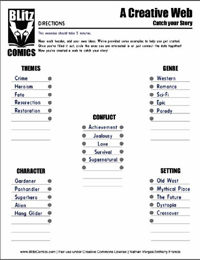 Our Comic Book Creator Kit has exercises like the Story Web, where you have the basic building blocks of a story, listed as major categories. Under each, you'll find interesting examples that you can simply circle. 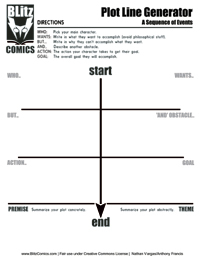 If you like, you can draw lines that connect your choices making a visual 'web'. Then you can activate your imagination, where you find how each choice connects to the others. Capture your story in the story web. Drawing takes time. Some of that time is invisible. (ok all of time is already invisible, that's why we need clocks) What we mean is that some bits of time are not experienced consciously so it seems to fly by. We've designed a visual clock that lets you see what happens during a single hour. 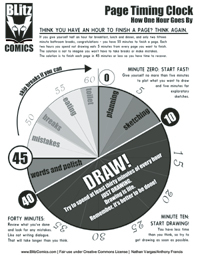 AS you can see, the majority of your time should be spent DRAWING. If you've completed technique #3 then that's exactly what you can do. It's not as scary as it looks...you can do it! Slip some gesture lines quickly onto the paper (where the fewest possible lines represent the total of movement). Do a 60 second online search for images that match what you see in your head. Your pencil should never stop moving for the total time you'll be drawing. If you hit a snag and don't know where to lay down the next line, put one down anyway and fix it later. You must get that image out of your head. It should be like playing 'Hot Potato' between your own brain and your hand. Ok, here's where we can only take you so far. The rest is up to you. When you've done all the prep work and your pencil is gripped in your hand, hovering over a blank sheet of paper (we assume you're using paper)...only you can get the images inside your head out. So far we've laid out some guides. We've helped you visualize where your time goes. Now we can only sit back and watch you take off. 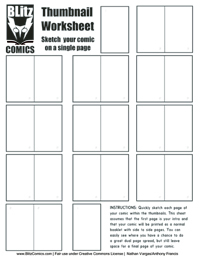 Without the cumbersome worries of 'what to draw', you can now slip upwards into the beautifully inspiring heights of imagination. Your personal stratosphere.